This product has to be one of my all time favorites, not only from the drug store but in general! These are highly pigmented and glide on smoothly. 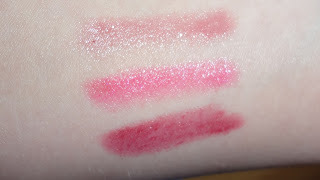 They are also moisturizing and, unlike other lip stains, will not dry your lips out throughout the day. The amazing thing about this product is that you apply it once and it stains your lips so you don't need to re-apply over and over again! I wore the Lovesick color out the other day and was amazed at how well it lasted! They are so low maintenance which I absolutely love. We want to be comfortable in our makeup throughout the day and not feel like we have to touch up every time we pass a mirror. For instance, I ADORE my MAC Sail La Vie red lipstick, but it needs to be applied several times throughout the day to maintain its bright and solid color. 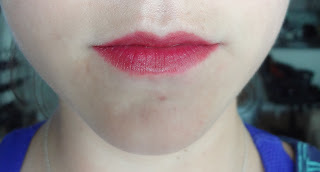 These lip stains are virtually effortless and the color stays put for hours. The colors themselves are also really lovely. There is a wide range of colors and I think they all seem really wearable. The one downside I have found to this product is the scent. It doesn't have an overly appealing smell or taste, but that is something that doesn't bother me too much. This item is definitely on the top of my list right now and I highly recommend it! I have no doubt I will be trying out some of the other colors in the near future :-) Let me know what colors you have tried and if you have any questions about this product!